There is nothing more special than a grandmother’s love. For those who are still lucky enough to have their grandma in their life, they must remember how important it is to make sure she feels this love from you, as well. To celebrate his grandma’s, or “Nan” as the family calls her, birthday this year, David Goodings decided to do something a little different. 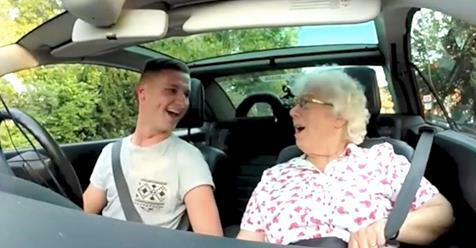 He picked his Nan up for a date. As soon as she was in the car, he turned the radio on, and they listened to some music. But then a breaking news report came on the air. His Nan listens carefully, and it turns out, the report is that it is her 86th birthday! All of grandchildren and kids are in on this report, which is a recording of everyone saying happy birthday and sending their love. David apologizes to his Nan that he wasn’t able to get one person in on it, as they were too hard to reach. But then, the report continues, and Nan is in tears after listening to it. You can see her wonderful reaction in the video below! If you enjoyed this, you will also love this video a man created from all the visits he made to his grandma’s house in a year.